Now the peak holiday season is more or less behind us – as much as it can be in this wonderful tourist destination we call home – it’s time to truly settle into summer and the delights our city has to offer. Last time we were at the V&A Waterfront; this week let’s go to the magnificent location that is the Camps Bay beachfront strip. It’s lined with a huge variety of eating and drinking options. Those in elevated positions offer stunning views of the beach, while sitting at pavement level brings with it its own special vibe. Zenzero is in the latter category. Our table at the very edge of the restaurant put us on the border of the hustle and bustle of the never ending stream of pedestrian traffic, while keeping it gently at arm’s length so as not to be intrusive. To celebrate the gorgeous sunny day, we began with flutes of bubbles. It’s the right thing to do. The elegant interior of the restaurant features entire walls of bookshelves which alone are an attraction and a delight. The food is good too. 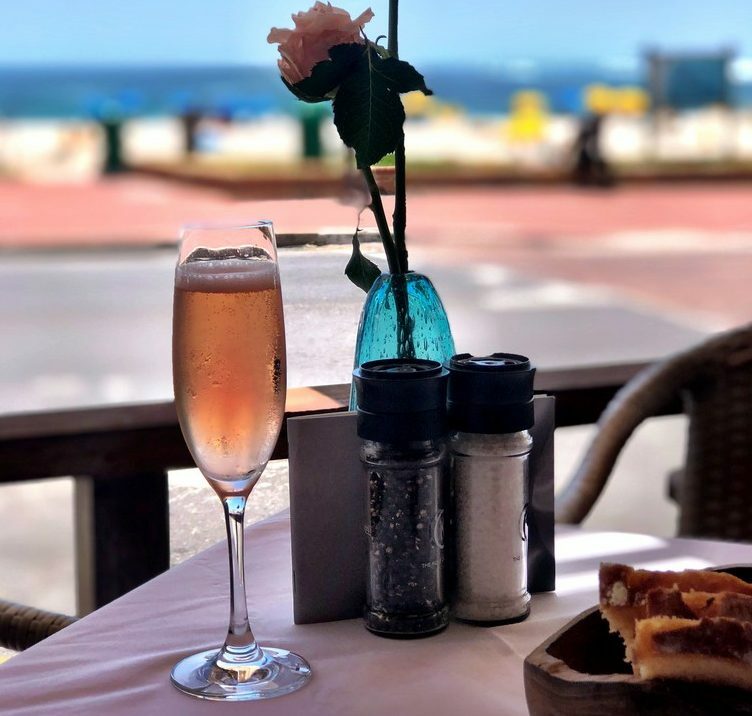 The menu has a variety of light dishes, from pizzetta (served from noon till 5pm), salads and antipasti which are great for a quick bite on your way to or from the beach, to more filling meat and seafood dishes if you’re settling in for the long haul. I began with a salad of mixed greens, cucumber, sundried tomatoes, olives, just-hard boiled eggs, red cabbage and cow’s milk feta topped with seeds and the house dressing. You can take it up a level by adding chicken and you’ll have a super summer lunch right there. With a glass of a crisp cold white wine, it doesn’t get much better. White anchovies – a favourite of mine – abound on the menu. Have them on their own with shallots, piquante peppers, lemon and olive oil; on a pizzetta with olives, mozzarella and basil; or in a salad: gem lettuce with anchovy dressing, parmigiana reggiano, and pancetta. I never know from one lunch to the next what my flexitarian friend will be eating, but on this day she was vegetarian. From the dishes which cater for this lifestyle choice, she had the cauliflower gratin (cauliflower cheese) which was an entire cauli topped with parmesan and mozzarella. Admirable, but personally – as much as I love it – I found the size a bit daunting although in its defence, it is a main course dish. Other veggie options are Burrata with lentils, mustard dressing and basil oil, and borlotti beans with Savoy cabbage and bread crumbs. There are many seafood options, from bass to sole to squid to prawns…salmon, mussels, tuna…the list goes on. For meat lovers, there are all the favourite cuts like sirloin, rump and fillet, grilled the way you like it; as well as meaty dishes like tagliata, lamb shank and lamb cutlets, chicken, pork, and the heavenly-sounding rump with black garlic, chilli and maple, which is paired with a glass of Glenmorangie Lasanta 12-year-old single malt whisky. Being in the mood for something a little lighter, I had the veal picante with capers, white wine, cream, parsley and lemon, with a side order of green vegetables lightly and simply seasoned with salt and olive oil. Still looking for what you want? Check out the pastas – tortellini with sage, butternut, puffed rice and toasted pumpkin seeds should hit the spot. Seafood linguine or vongole will bring a taste of the Mediterranean to your table, as will the classic spaghetti aglio e olio with olive oil, chilli, garlic and parmesan. Save some space for dessert, whether it’s affogato, tiramisu or sorbet, or splurge with a slice of white chocolate cheesecake with sour cherries and vanilla ice cream. * Zenzero is open daily from 11am till 11pm, Zenzero is at 2A Victoria Rd, Camps Bay. Telephone 021 438 0007.